Be Part of the Nation’s Largest Network of Medical Examiners! Belonging to TeamCME is a no brainer! 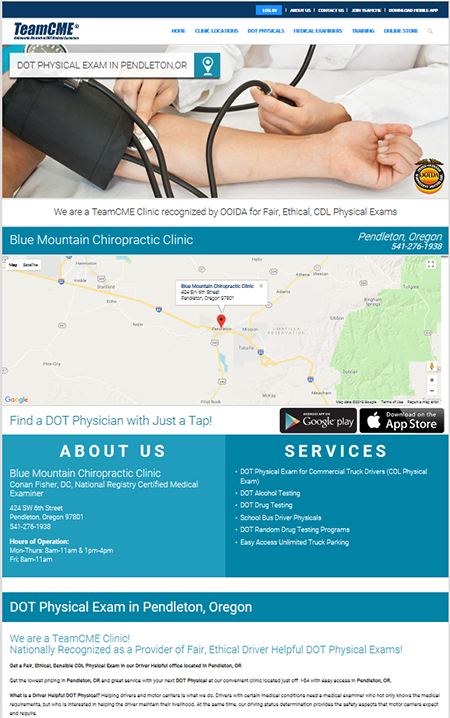 The TeamCME internet marketing, webpage, website and discounts on products and Lab/MRO services are a must for anyone doing DOT physicals! I have been a member for over a year and it has truly been a pleasure. Incredible support, professional interaction, always has the correct answer, and very accessible. This is the elite Team to be a member of! TeamCME Monthly Membership is only $29.95 a month. Apply today for access to powerful TeamCME internet marketing, services, products, and training that will set you apart and make you the out-standing CME in your area. 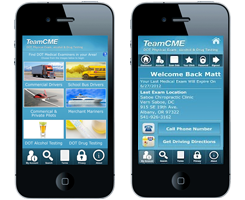 Have unlimited access to the TeamCME membership content such as medical condition clearance letters to send to treating providers, newsletters that keep you updated, single subject “Safe Harbor” training videos, and a listing on the TeamCME map and mobile app that currently have over 30,000 page views a month (84% being new visitors). You can be on Google Page 1 results and on the Goggle Business Map feature as a TeamCME Clinic! Have a difficult physical exam, drug or alcohol test? Call TeamCME for help. Take your practice to the next level and above! See below for member benefit details! APPLY TODAY! Perform more services! When You Know Better! You Do Better! Offer the Full Spectrum of DOT Services with TeamCME Membership for only $29.95 a month! Exclusive Access to our Experts when you have a question on CDL Physicals, Alcohol & Drug Testing and More! TeamCME Newsletters keep you up to date, prepared, knowledgeable and ahead of the pack!! TeamCME.com Clinic Map where you’re right in front of drivers, pilots, mariners and others looking for a Physical! Free Driver & Pilot Mobile App: Displays your clinic using GPS, Expiration “Alerts” sent to your clients automatically! Advanced Single Subject Training! Free for Members! Short Videos to “Bullet Proof” your driving status decisions. Cost-Effective, Ethical Sleep Apnea Home Based Testing, Use our OSA partner or offer OSA testing in your office! Be just a click away from drivers using our Online Map (and our Free Driver Mobile App)! With our Free Driver Mobile App, Your Clinic is literally at the driver’s fingertip! “Killer” Dedicated Webpage Looks and Functions like your own Website! You’ll Be on Page 1 of Google Search Results for your area! Unbelievable! Advanced Features and Convenience sets your webpage apart from other websites! Already got a webpage? Doubles, Triples, or Quadruples your presence on Google Page 1! Yes! We can link your webpage to your website and vice versa! Unbeatable!! Absolutely the Biggest Bang for the Buck Available!!! Advanced Training Available to perform consistent, ethical, reliable DOT physical exams with confidence! You’ve got Backup! Call us for those difficult exams, drug or alcohol testing.